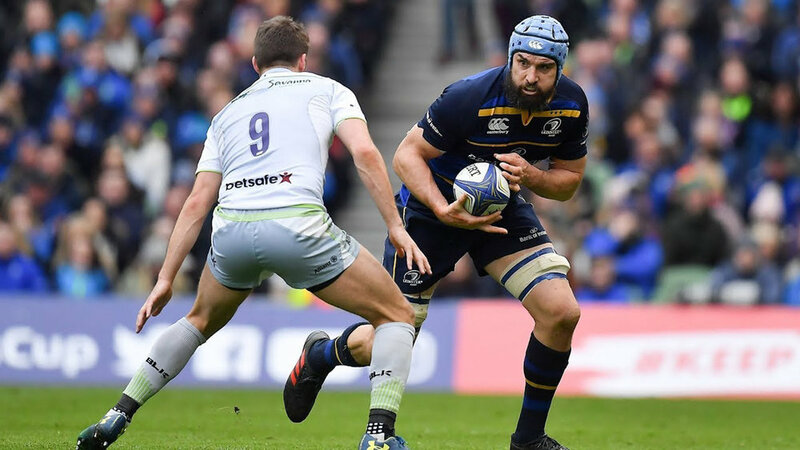 Scott Fardy, Leinster’s superstar Australian flanker, has sought to calm Irish rugby fans fears over a pre-World Cup form slump. Fardy, who has extended his Leinster contract by a year, said he thought Ireland were still in good shape to have a tilt at winning the Rugby World Cup which begins in September. “I wouldn’t be overly worried about things happening before [the World Cup]” Fardy told The Irish Times. “You’ve got seven games to win the thing. Sometimes you have small dips but I don’t [see an Irish crisis]. Fardy signed with Leinster in 2017 and has made 37 appearances since. In his first season in Dublin, Fardy helped the province to a Heineken Champions Cup and Guinness PRO14 double in a campaign which saw him make 22 appearances and score four tries. “I’ve re-signed so I’ll be going again for another year,” the 34-year-old told reporters. Ireland’s delighted coach Joe Schmidt and captain Rory Best after the historic win. Steve Hansen has installed Ireland as World Cup favourites following their 16-9 win over his New Zealand side in Dublin. All Blacks boss Hansen hailed Ireland as the "number-one team in the world" following their superlative victory over his back-to-back world champions at the Aviva Stadium. New Zealand retained their world number-one status despite losing to number-two side Ireland - but head coach Hansen had claimed before the clash that the winner would swipe the global bragging rights. The All Blacks boss stuck to his word in the wake of Ireland's triumph, and even labelled Joe Schmidt's Ireland as the front-runners for next year's World Cup. "As I said earlier in the week this was number one versus number two in the world," said Hansen. "So as of now they are the number-one team in the world. All Blacks coach Steve Hansen at the Aviva Stadium. Jacob Stockdale's 12th try in just 14 Tests sealed Ireland's second-ever victory over New Zealand, backing up their maiden win over the All Blacks in Chicago in 2016, the 40-29 triumph. Ireland defended for their lives in the second-half and shut out the All Blacks, with the visitors tryless for the first time against a northern hemisphere nation since the 1995 clash with France. Ireland boss Schmidt insisted afterwards however that All Blacks coach Hansen installing his men as World Cup favourites should be viewed as a cute ruse. Asked if Hansen's words should be viewed as kidology, Schmidt said: "I think he probably enjoyed a little bit of banter. "I've huge respect for Steve, Fozzy, and Scott MacLeod, their coaching staff. "So for us to be favourites when they have been the world number-one team for nine years, and continue to be the world number-one team. "We were at home, and they were coming off a long series of games where they have travelled around the world a number of times. "I thought the crowd were phenomenal tonight. And that's a lot of things stacked in our favour. "So we'll take tonight, and leave 11 months' time for 11 months' time." Asked if Ireland are now World Cup favourites, Schmidt added: "The World Cup? In 12 months' time? "We've got to work hard to make sure we're ready for the USA (next Saturday). "People will I suppose postulate about who's where, who's favourite. It's a nebulous thing for us."